I love family and I love storytelling. As a photographer I get to combine these two things, and it's the absolute greatest job in the world! A story that often gets retold in my family is from when I was about 6-years-old. My mom had locked me in my bedroom, because that was the only way to keep me in time out - I was a bit of a wild child! Wearily, she made her way downstairs to do some housework. As she peered out the dinning room window, much to her horror, she saw the screen from my bedroom window come crashing down! She got upstairs just in time to stop me from jumping out of the second floor window. I don't know how I could have possibly thought that would end well, but that was my 6-year-old prison break plan to get out of time out. One wild story among many. As a child, I loved hearing stories about our family: stories from my grandparents' lives, stories from my parents' lives, stories from my own life before I could remember it, and even re-hearing stories from my childhood that I already remembered well. Because no matter what generation a story comes from, there will always be kids doing crazy things, overworked parents doing whatever they can to get through each day, sweet tender moments, and countless things to laugh about. This is real life, in all its glory. Not only do I want my clients to spend time reliving their family stories, but I want them to have amazing photos to go with their stories. And nothing is better than candid shots from real life to help preserve these memories! No direction I could provide will even compare to the crazy things your kids will come up with on their own. And no matter how crazy it might make you as parents feel in the moment, you will want to remember it. Kids are lunatics. Parenting them is hard. But loving them is easy. And they love you right back, which makes it super rewarding. Get in touch with me. I want to create amazing imagery to go with your family's stories! I was an enormous baby. At birth, I weighed 11pounds, 12 ounces! 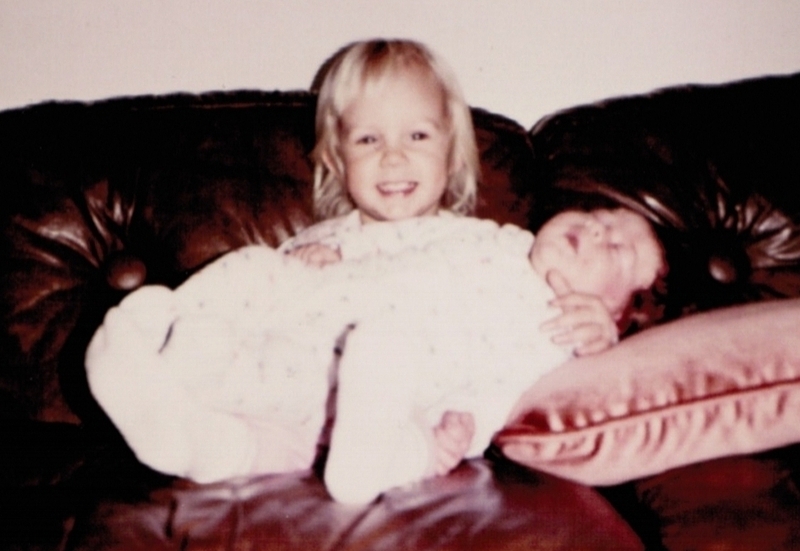 Look at this picture of my older sister holding me. She was 16-months and we are practically the same size. And get this, I wasn't even my mom's largest baby. Good grief! My mother is Wonder Woman as far as I'm concerned! This is my favorite photo of myself as a small child. I don't remember this moment, but I can imagine how I felt - totally independent and free! A little bitty kid on a great big swing. This picture feels like childhood to me. I grew up in Tennessee, which was halfway between my mother's home in Florida and my dad's in Minnesota (you can imagine the climate control issues in our house). I'm the second of four kids, and I love being a middle child! It's true I was initially upset to be ousted from the position of baby in the family, but after the dust settled I discovered being in the middle is a great place to be. I always had someone to play with, someone to hide behind, someone to boss around, someone to watch my back, someone to share secrets with, and lots of people to love. 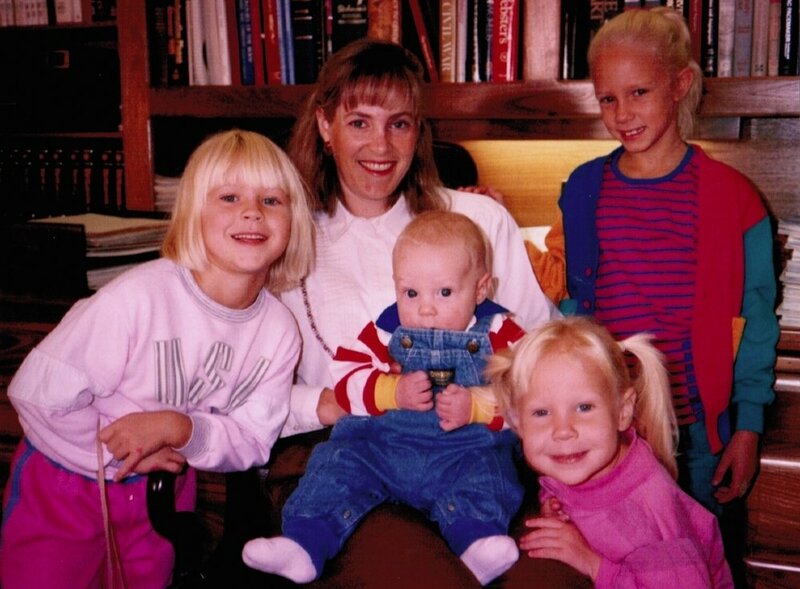 My siblings have always been my best friends. I started my own family the day I married a truly amazing man. He makes me smile every day! And he is an amazing father to our girls. The parenting thing is a challenge at times, but I couldn't have picked a better partner in crime. And last, but certainly not least I am the mother of two amazing little girls. I didn't know the depth of love I could have for another human being until I became a mother. As the photographer in my family, I think it's important to find time to be photographed as well. It's all too easy to be absent from my family photos. But when my girls are grown I want them to remember what it felt like to be in mama's arms. I want them to know how much I always have and always will love them. They are my everything!